This registry workshop will tell you what do when all installed software not listed in Uninstall or change a program window in Windows 10/8/7. When we install a new software to our Windows operating system, generally its entries are created in the registry database of system as soon as the installation finishes. The registry entries helps both Windows and program itself to perform various operations, for which the program is created. This is quite technical and beyond the perception of a normal computer user that how the registry works behind propagating a software. However, some techies may find it easy to understand. Well, sometimes when the program’s registry entries bypass the restrictions defined for registry database, some strange things may happen. For example, if the program you installed have its display name more than 63 characters in the registry database, then program will no longer be listed in Uninstall or change a program window / list. 4. In the above shown Edit String box, make the Value data less than 63 characters by shortening or omitting certain characters. Click OK when you’re done. Close the Registry Editor and reboot the machine. 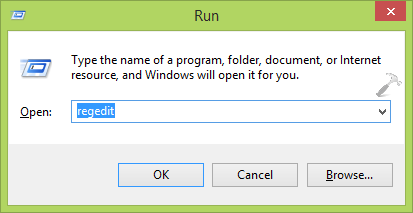 After restarting the system, the missing program should listed in Uninstall or change a program list. Hope this helps! Also learn how to add Microsoft Management Console (MMC) programs to desktop context menu in Windows 8 or later. I recently upgraded from Windows 8.1. The first thing I did after upgrading was to check the Settings app in the Start Button, instantly after clicking the app it instantly crashes, tried restarting my PC even shutting it down for half day and still no luck. So I seriously need help with this because Windows put ever important components there such as Windows Update (How can I patch updates if I can’t access it) and even Recovery Option (How am I suppose to downgrade without losing my files). I’m having no luck here, so please anyone can you me?